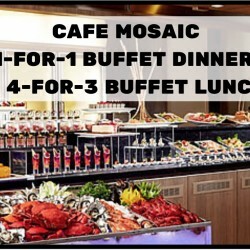 Indulge in a buffet feast at Carlton Hotel's Cafe Mosaic with their dining deals! Enjoy 1-for-1 buffet dinner or 4-for-3 buffet lunch with Citibank and UOB cards! Promotion ends 31 March 2016.